A combination of collagen growth and a thread lift which contours the CHEEKS, JAWLINE, EYEBROWS & NECK giving you the results you want to achieve without surgery. 1st Action is the actual threads anchoring and giving you the lift. 2nd Action is the collagen growth which tightens your skin. What is a Silhouette Soft Thread Lift ? Rejuvenates regenerates and improves the structure of the face, in a similar way to a surgical facelift, but without the need for surgery. The Thread Lift uses specialised threads which are introduced into the skin with a very fine needle to lift tissue and muscle and improve skin texture. The threads are extremely versatile and can be used all around the face and neck. They can treat vertical and horizontal wrinkles on the Forehead, sagging brows, drooping cheeks, pronounced nasal labial (nose to mouth) and marionette (corner of mouth to chin) folds, sagging jaw line and neck and folds and wrinkles on the chin. What happens to the threads once they no longer work? The components are entirely reabsorbed into the body which is totally natural. What is PDO Thread ? PDO collagen stimulation threads, improve the skin texture and produce a tightening effect overmore than 12 months. 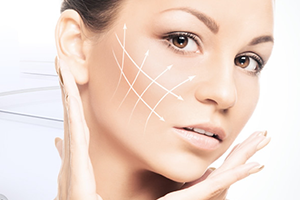 Possible sites of application are the double chin, the cheeks, the forehead, under the eyes, and much more. It takes 6-8 weeks to develop the effect. Barbed PDO threads are ideal for a gentle cheek or eyebrow lifting, with an instant result, lasting more than 12 months.Both types of threads dissolve in a natural way. Who performs the treatment ? Our in-house GMC registered doctors.